Coaches at Foxhills Club & Resort are convinced the booming success of the FoxStars Junior Golf Programme will unearth a new Paul Casey. 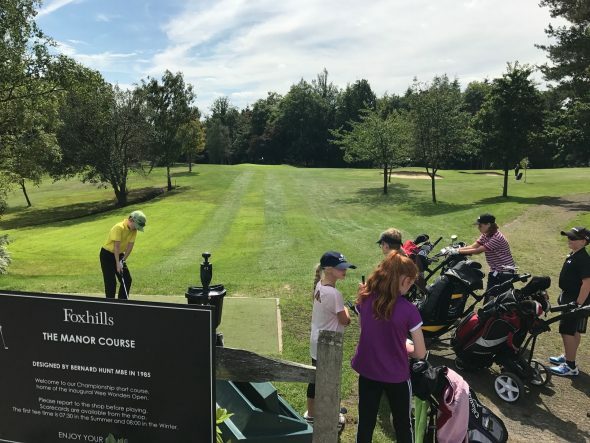 The historic club, based in Ottershaw, Surrey, is playing a vital role in producing a new generation of golfing superstars with its innovative 10-week coaching programme aimed at young golfers from the age of five to 16. Foxhills, with its two Championship courses, a par-three nine-hole course and excellent practice facilities, was the venue when Casey took his fledgling steps in the sport at the age of 11 and his career has since blossomed with three appearances in the Ryder Cup and 19 professional victories on his CV. And senior PGA professional Pedro Lemos, who oversees the FoxStars Junior Golf Progamme alongside former Sunshine Ladies Tour player Lauren Blease, believes the opportunity is there for others to follow in Casey’s illustrious footsteps. The Portuguese Lemos, who has also played on the European Tour, said: “We aim to give the young players the quality of coaching to help them achieve their ambitions in golf, whatever they are. “The FoxStars Junior Golf Programme had 25 members in September and now we have already grown to 65. But we want to see this continue to grow and flourish. We want to see more junior golfers learning the skills and developing their passion for the game. For some of them, we hope that could mean a career as a future professional. The 10-week course starts at £120 per person and are held on both Saturdays and Sundays with each player given a free assessment by either Lemos or Blease before starting the course to ensure they receive the correct level of tuition. Even the youngsters who have never picked up a club before are just as welcome to start their journey into golf as students earn certificates and medals for making their way from levels one to 10 with a mix of tailored instruction, challenges and interactive competitions. For more information, visit the website at www.foxhills.co.uk/golf/golf-lessons/foxstars, email proshop@foxhills.co.uk or call 01932 704468.